When you hire a moving company in Natick, Massachusetts or anywhere else in the local area, you are hiring a service. The service is designed to help you with all of your moving needs for a residential relocation. Whether you are moving locally or out-of-state, you need to work with local Southeastern Massachusetts and Cape Cod moving services which can take care of all your needs. Residential moving in New England can be complicated, depending on the time of year. Planning a move in the winter, when inches or feet of snow can fall overnight is a challenge. Moving into an upstairs apartment on a narrow street with no elevator requires skill and experience. Whatever your needs, it is good to know that there are companies like Statewide Moving Company to get the job done right. If you hire our team to take care of all your moving services in Massachusetts, including professional packing, it is good to know what to expect. Your contact at our moving company will go over the schedule and let you know when we will be there. But what are you supposed to do while the packing is going on? Is there anything you need to do to prepare? If you have never used professional packers as part of your plan for residential moving in New England you might not know what to do. Most moving companies prefer if the homeowner is present while the packers and movers are taking care of Cape Cod moving services in their home. You do not need to supervise the packers and movers, but they might have questions for you about how you want things packed and how boxes should be labeled for easier unpacking. You will also need to sign some paperwork and go over details with the representative. The amount of time required to complete this will depend on the number of belongings that need to be packed up and moved. Packing the entire household can usually be completed in a single day and is generally done on the day before the actual move. This is a common question. Of course, you can pack some of your personal belongings if you want to do it yourself. Some people don’t feel comfortable having movers pack up their clothing items or prefer to pack up fragile items themselves. However, in the case of antiques or fragile items, such as your grandmother’s china tea set or crystal vase, make sure to ask about moving protection. 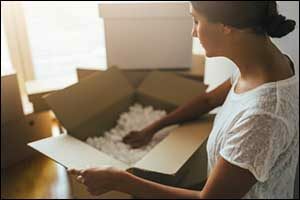 If you pack the items up yourself, they may not be covered under the moving insurance. In that case, you might want to transport the items yourself in your own personal vehicle. If you have any questions about packing or moving services in Massachusetts or to another state, make sure to speak with a representative. When moving day arrives, it is also important for you to be present. Do not have a friend, neighbor, or real estate agent do this for you. You will do a walkthrough with the moving van operator and crew. You can take this time to instruct them on any items that you do not want to be moved. This is also a great time to ask any additional questions that may have come up after packing day, or to voice any concerns about certain items that are important to you. The movers will tag and inventory all of the cartons and items that need to be moved, noting any pre-existing damage on the inventory form. Once everything has been looked over and readied for moving, the truck can be loaded. Once the movers begin the process of loading the furniture and other items into the truck, then you can leave the house and take care of other business. If you need to sign any final documentation after the truck has been loaded, the van operator will let you know. Depending on the number of items and type of move, sometimes additional paperwork, signatures, and acknowledgments are required. This is how professional residential moving in New England works. Copies of everything will be provided for your records. The moving truck will go to your new address, and everything will be unloaded. If you paid for unpacking services, a crew will come to the new location and unpack everything for you, removing all of the packing boxes and debris. When you contact Statewide Moving Company to take care of your moving services in Massachusetts, you can rest assured that you will have a worry-free moving experience. Our team of highly trained and experienced movers will help you to get everything to your new residence safely and securely. Give us a call at 508-620-6411 to speak with one of our agents or to schedule a consultation with our moving company in Natick, Massachusetts for top quality Cape Cod moving services.